One of the city's biggest entertainment events of the year will take place Sept. 19-21. There will be food, beverages, musical entertainment and more. 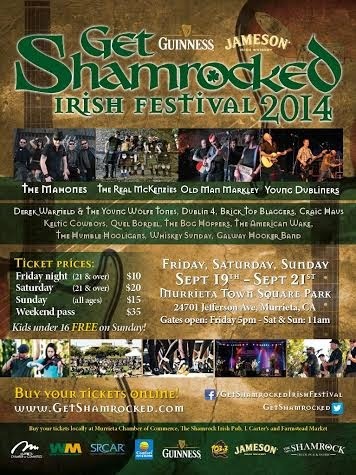 Check the flier for details, call the Murrieta Chamber of Commerce at 951-677-7916 or visit www.getshamrocked.com. Hours are 6-10 p.m. Friday, 12-9 p.m. Saturday and 12-6:30 p.m. on Sunday. Gates open at 5 p.m. Friday and 11 a.m. Saturday and Sunday.